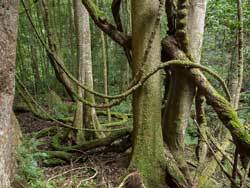 Rainforests of the Greater Blue Mountains contain the descendants of the lush forests that once covered the ancient super-continent of Gondwana. Today they occur only in isolated pockets, where moisture and steep terrain have ensured their protection through the ages from the extremes of drought and fire. Rainforests occupy just over 1% of the Greater Blue Mountains landscape, and are confined to locations that are reliably moist, have moderate to high levels of soil nutrients and minimal exposure to fire. They can be identified by their closed canopy of relatively soft (i.e. non-sclerophyllous, or mesophyllous), horizontally held leaves and shade-tolerant, moist understorey characterised by ferns, herbs and vines. 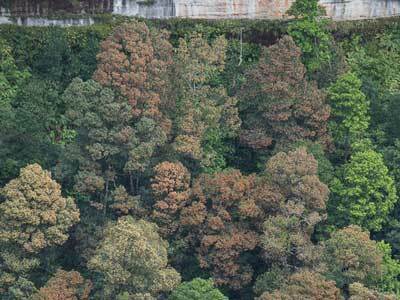 Rainforests usually merge with wet sclerophyll forests around their margin, as the frequency of exposure to fire increases and the reliability of soil moisture decreases. 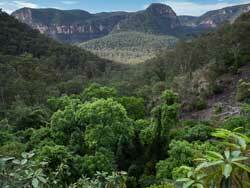 Three classes of rainforest occur in the Greater Blue Mountains. The most extensive class is Northern Warm Temperate Rainforests, a verdant mix of Coachwood (Ceratopetalum apetalum), Lilly Pilly (Acmena smithii), Sassafras (Doryphora sassafras) and Cedar Wattle (Acacia elata) trees; tangled vines weaving up to the light; soft-leaved shrubs; and scattered ground ferns and herbs. 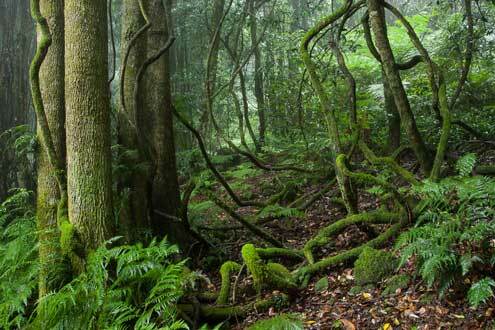 Mosses, liverworts and lichens occur on tree trunks and the forest floor. These forests occur in small disjunct patches scattered across the protected lower slopes and creek lines of deep sandstone valleys – unique places that have long been protected from fire by escarpments, gorges and moist conditions. They are most common in relatively high rainfall areas (of Blue Mountains, Wollemi, and Kanangra-Boyd national parks) and less common in rain-shadow areas (Yengo and Nattai). Some sub-tropical elements can be found in this class, most notably in the rainforests around Mountain Lagoon where Cabbage Tree Palm (Livistona australis), a species more commonly found closer to the coast, is prominent. An intermediate form between Cool Temperate Rainforests and Northern Warm Temperate Rainforests is also prominent, occurring on highly localised, fertile, upper slopes of basalt-capped mountains, including Mounts Tomah and Wilson, and in the upper gorges of western Kanangra-Boyd National Park and Jenolan Karst Conservation Reserve. These places are characteristically cool and moist as a consequence of their high rainfall and often misty conditions. As with warm temperate rainforests, the canopy consists of Coachwood (Ceratopetalum apetalum) and Sassafras (Doryphora sassafras); however, it is the lush tree ferns and abundant mosses cloaking rocks and fallen logs that distinguish this intermediate form from other rainforests in the Blue Mountains. Adjoining wet sclerophyll forests are often dominated by imposing eucalypt giants such as Brown-barrel (Eucalyptus fastigata) and Mountain Gum (Eucalyptus cypellocarpa). 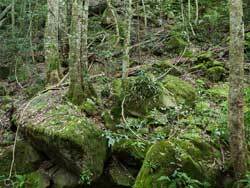 The lesser-known Dry Rainforests occur where creek lines, rock outcrops or scree slopes provide localised protection and moderate soil nutrients in otherwise depauperate, rough terrain dominated by dry forests. Usually, there is a dense canopy of Grey Myrtle (Backhousia myrtifolia) interspersed with Rusty Fig (Ficus rubiginosa), Mutton Wood (Rapanea variabilis), Native Quince (Alectryon subcinereus) and species of Pittosporum. Emergents such as Forest Red Gum (Eucalyptus tereticornis), Grey Gum (Eucalyptus punctata) and Blue Gum (Eucalyptus deanei) may also be present. 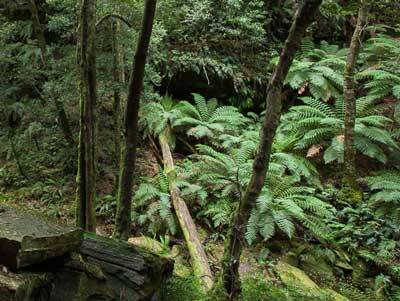 It is the least diverse form of rainforest in the Blue Mountains, characterised by an often sparse shrub layer and ground cover of ferns, vines and herbs. Prominent areas of occurrence include the gorges of the Kowmung and Shoalhaven rivers, around the tributaries of the Hawkesbury River, and in protected rocky limestone pockets in Wollemi and Yengo. 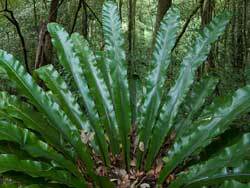 A rare form dominated by Stinging Tree (Dendrocnide excelsa) occurs on the steep basalt scree slopes of Mount Wareng and Mount Yengo. Another unusual, intermediate form occurs in a small number of deep sandstone gorges in north-west Wollemi, particularly around the headwaters of Widden Brook, where soils have been enriched by the basalts of Nullo Mountain: it contains Sassafras (Doryphora sassafras), a species typical of Northern Warm Temperate Rainforests, and Red Cedar (Toona ciliata) and Stinging Tree (Dendrocnide excelsa), species that are more typical of Dry Rainforests in the Greater Blue Mountains. Western Sydney Dry Rainforest (endangered), which occurs in the Hawkesbury area, is likely to occur in the lower Blue Mountains within the GBMWHA. 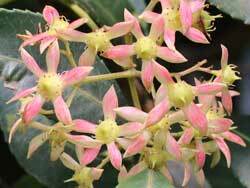 Also known as the Southern Sassafras, this winter flowering tree is found near water in sheltered gullies. It is the only species in this genus. Widespread in rainforests where it is commonly found both on rocks and as a large epiphyte in trees. 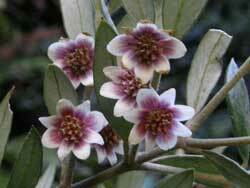 Identified by its grey bark with white mottles and five sepal flowers in summer. Coachwood was used in early coach making, WWII 303 rifle butts and for the frame of the Mosquito fighter-bomber (an all wood construction). In this volcanic diatreme, Red Cedars (Toona ciliata) tower behind a Rusty Fig (Ficus rubiginosa) on the left and a Pittosporum on the right. 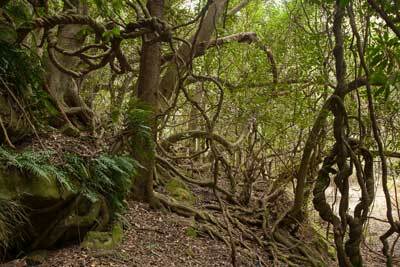 This rainforest, with Coachwood (Ceratopetalum apetalum) and massive lianas is typical of that found in deep, protected gorges of western Wollemi. These forests can be quite open in the understorey, because not much light penetrates the dense canopy. Moss and ferns tend to dominate.